SS sergeant Oskar Groening convicted by German court after admitting to 'guilt' for his role massacring Jews at Auschwitz. A 94-year-old former SS sergeant and Nazi guard at the Auschwitz death camp was convicted on Wednesday by a German court, and sentenced to four years in jail. 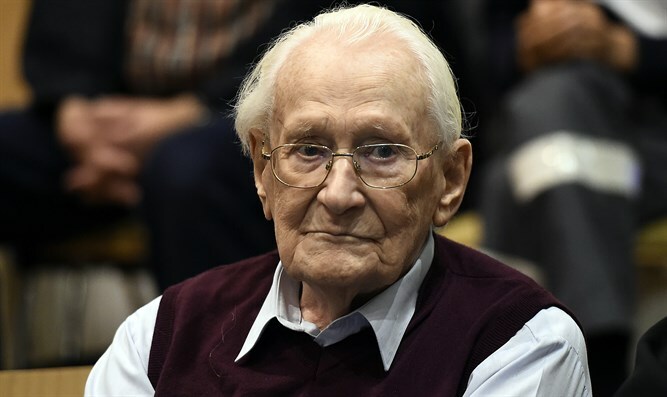 Oskar Groening has been dubbed the "bookkeeper of Auschwitz," given that he was tasked with organizing and counting the belongings stolen from Jewish prisoners at the death camp. He was found guilty of being an accessory to the murder of more than 300,000 Jews, after having previously admitted in court to his guilt. At the trial, which was held in Lueneburg in northern Germany, several survivors of the Auschwitz death camp appeared and gave testimony against the former Nazi guard. Groening has admitted to guarding prisoners' baggage after they were unloaded from cattle cars onto the ramps of the camp in Nazi-occupied Poland, as well as collecting and counting money stolen from the new arrivals and sending it to Berlin. The range of possible jail time against him spanned from between three and 15 years in prison. In court, Groening said in a statement read by his lawyer: "I’ve consciously not asked for forgiveness for my guilt. Regarding the scale of what took place in Auschwitz and the crimes committed elsewhere, as far as I’m concerned I’m not entitled to such a request. I can only ask the Lord God for forgiveness." Over one million people were murdered at Auschwitz, and nearly all of them were Jews.